After attending a funeral directors convention, William Brock Jr. a Navy veteran, firefighter, and former captain of the Wyckoff (NJ) Volunteer Fire Department, went back home with a purpose in mind--to honor those veterans unfortunately forgotten about or left behind. Flying back home, his wheels were already in motion and he couldn’t wait to speak with his staff at the Vander Plaat funeral home, especially his son, Tim, assistant chief of the Wyckoff Volunteer Fire Department and fellow mortician. Employees combed through the records of their unclaimed remains over the years in hope of reuniting families with their loved ones. Many were reclaimed but unfortunately many were not, among them six local veterans. After going through all the proper channels and exhausting searches for next of kin and following the state laws, the New Jersey Mission of Honor (NJMOH) was contacted. The organization is made up of veterans who dedicate themselves to the service of country and state. Along with other veteran groups, they honor and inter the cremated remains of unclaimed or abandoned veterans. After discussion and meetings, the arrangements were made and a memorial ceremony and internment followed. 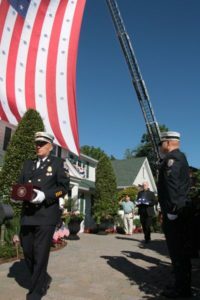 Many local state, county, town, and military officials attended the ceremony with local fire departments, police departments, and veterans groups were in attendance. 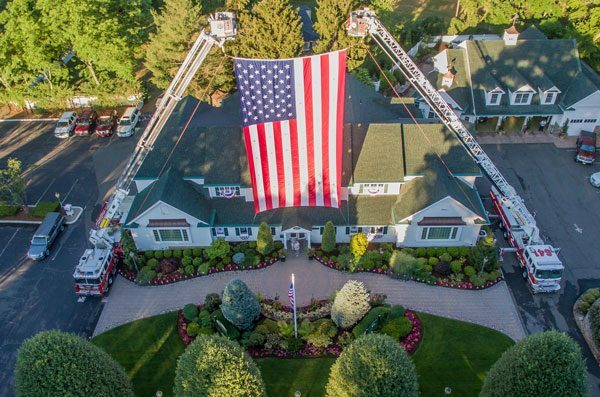 The remains were memorialized at the funeral home that had a large American Flag hanging over the building’s entrance supported by the Wyckoff and Waldwick Fire Department’s tower ladders. Once removed from the building by firefighters, police officers and veterans honor guards, the six veterans were honored with a 21 gun salute and the playing of taps. They were then transported to the hearse with other members in full salute. A procession proceeded to the Veteran’s cemetery in Wrightstown, New Jersey, just outside Fort Dix. The hearse bore the seals of the Armed Forces on it, and was attended by Wyckoff’s Engine 234, an honor guard of motorcycles from the Patriot Guard Riders, and the New Jersey State Police. After internment, all those who played a part in the ceremony felt a sense of honor and accomplishment that they were able to bring those left behind to their final resting spot amongst their fellow veterans. MICHAEL N. CIAMPO is a 30-year veteran of the fire service and a lieutenant in the Fire Department of New York. Previously, he served with the District of Columbia Fire Department. He has a bachelor’s degree in fire science from John Jay College of Criminal Justice in New York City. He is the lead instructor for the FDIC Truck Essentials H.O.T. program. He wrote the Ladder chapter and co-authored the Ventilation chapter for Fire Engineering’s Handbook for Firefighter I and II (Fire Engineering, 2009) and is featured in “Training Minutes” truck company videos on www.FireEngineering.com.